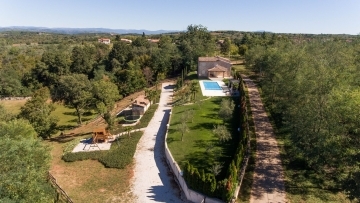 This beautiful villa is situated in a small medieval Istrian village. The villa was built in 2007 with old-fashioned and modern style at the same time. The villa is very spacious and ideal as luxury residence. The large kitchen with dinning rooms leads to the covered terrace overlooking the pool and Istrian mountains. The villa is surrounded by lush green scenery. It's a spacious living room with traditional open fireplace, satellite TV, internet and doors to pool terrace. 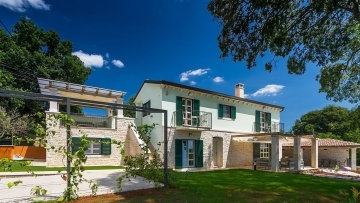 The villa is also a truly quiet retreat and it is located within easy travelling distance to all parts of Istria.